SBI PO Cut off 2018: Candidates can check official SBI PO Mains cut-off 2018 at sbi.co.in/careers. Complete details about the cut-off of SBI PO Mains 2018 will also be available here after the declaration of SBI PO Mains 2018 result. SBI PO Mains Cut-off 2018 is expected to be high this year and experts at Jagranjosh.com believe that SBI PO Mains Cut-off 2018 might be 20% to 30% higher than previous year’s cut-off. There is no sectional cut-off in SBI PO Prelims. Some candidates often search state-wise SBI PO Cut-off 2018; such candidates should learn that there is no state-wise cut-off in case of SBI PO Mains and Prelims. Candidates preparing for SBI PO Recruitment exam 2018 often ask questions about “Expected SBI PO Mains Cut-off 2018" or “Overall SBI PO Expected Cut-off”. Official SBI PO Cut-off 2018 (General, OBC, SC, ST and other categories) will be declared by State Bank of India (SBI) after the announcement of the SBI PO result. But, here we can give you a brief idea about the expected SBI PO Cut-off 2018 (Prelims, Main & Overall). Many websites mentioned that there will be no considerable change as there is no major change in the difficulty level of questions of SBI PO Mains. But this is not the only factor which affects SBI PO Mains Cut-off 2018. Let’s learn other various factors which will influence SBI PO Mains Cut-off 2018. Many websites mentioned that there will be no considerable change as there is no major change in the difficulty level of questions of SBI PO Mains. But this is not the only factor which affects SBI PO Mains Cut-off 2018. Let’s learn other various factors which will influence SBI PO Mains Cut-off 2018. This year, a major change is observed in the SBI recruitment process. To understand this change let’s have a look at the old and latest notification of SBI Recruitment. In both notifications, we have highlighted a critical line which will affect the SBI PO Prelims cut-off 2018. In the previous SBI PO Prelims exam (2017), the candidates who qualified for Mains were approximately 20 times the number of total vacancies. 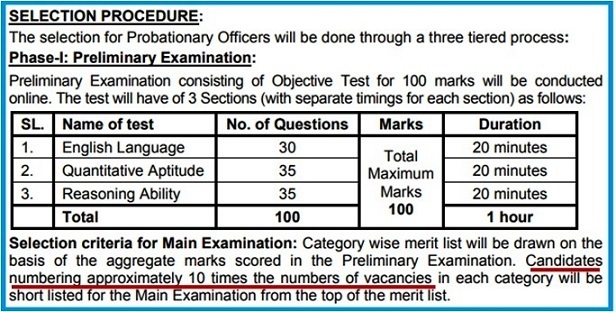 This year (2018), the candidates who will get qualified for Mains Exam will be 10 times the number of total vacancies. So, this is the reason why SBI PO Prelims 2018 Cut-off was higher. What was the expected cut-off of SBI PO Prelims 2018? In our prediction, we have considered that there is no major change in the difficulty level of the questions, this year. The number of vacancies has decreased from 2300+ to 2000 and numbers of candidates are increasing continuously year after year. Keeping all these factors in find, here we predicted the SBI PO Cut-off 2018 for prelims and mains. Let’s understand what the above table implies with the help of an example. Suppose SBI PO Prelims Cut-off 2017 for a specific category is 43.25. Then, this year expected SBI PO Prelims Cut-off 2018 is between 51.9 marks to 56.23. In the same way we can calculate the range of expected SBI PO Prelims Cut-off 2018 for all the categories. In this article, we have also provided previous year SBI PO Cut-off (year 2017 and 2016) for prelims and mains. A rise of 20% to 30% in the cut-off score is also expected in overall SBI PO Cut-off 2018 (Interview and Mains). As explained in the example above, one can easily calculate category-wise SBI PO Cut-off 2018. The above data and its analysis will give you a complete idea about expected SBI PO Cut-off 2018. Candidates preparing for SBI PO Recruitment exam 2018 can now plan their preparation strategy accordingly.